In honor of McDonalds serving the VERY delicious Sweet Tea in all their restaurants nationwide, this blog will be about a Mississipi fivesome that ROCKS the fruit off the liquor tree. There is no such thing as a Liquor tree, but the God/Christianity-infused lyrics, found on both their self titled EP and the first full length release "Plunder, Beg, And Curse", are something to wonder about. Or are they? They are from the South. "There is a lot of God-talk, which may alienate some people," Cajoleas, one of the three guitar players, says. "It's kind of a vocabulary thing, whether or not you believe in God. The vocabulary of the church is in the way people talk around here, so a lot of the religious allusions come from that. It's like unpacking some of the garbage you've been fed about it. There's a lot of religious confusion and family conflict down here. I think that conflict is in the music. It's an old times/new times conflict, and, a lot of times, a God conflict." It's not just God though. Many of the lyrics seem to be very personal accounts of pain and love. One such song is "Innocent and All" which is a song about that cheating girlfriend who we can't get over that shows up in so many songs. I love symbolism-soaked lyrics almost as much as I love music that is dark, with layered guitar and frenzied feedback. 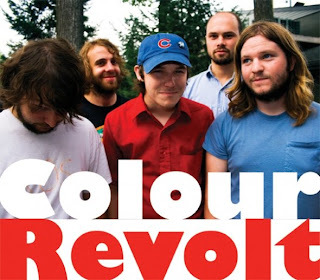 Colour Revolt meets all my needs! If memory serves, I bought the EP based on a suggestion from another band that I was getting really into. The EP was perfect. It was dark, angry, and gave me enough of a taste that I was excited to finally get my teeth into the full release. Shortly before the band was to enter the studio to record the sessions for Plunder, Beg, and Curse, someone stole the band's van, trailer, and all the equipment in them. One of the major losses was an old piano that helped shape much of the sound of the EP. Also, Plunder, Beg, and Curse was recorded very quickly. "We recorded the whole album pretty much live over a week and a half. There's an urgency to it." says Cajoleas. It might be this urgency that gives this record its special feel. It's both hard and atmospheric; delicate and overpowering; simple and complex. I am struggling with accurately describing the album because it seems frenetic. Hell... I like it because it is frenetic. It's unsure. But I am sure you will like it. This is a dark, brooding band making equally dark and brooding music. 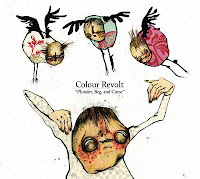 Colour Revolt probably will be coming to a town near you. Make sure you make it out to see them. Buy a t-shirt too...a touring indie band gets killed on the gas alone it takes to get from venue to venue. Plus it will keep these kids from getting jobs. I know I want to see what that sophomore effort will sound like. By the way, I grabbed a snippet (below) from the bio the band has on their PureVolume profile. Any ideas what it means? The insects will grow fat on our blood. And what of it? The dogs will outlive us, by God. And they deserve it. What have you ever done?